The gated community of private homes in Reflection Lakes offer a range of living options from townhomes, carriage houses, and luxury single-family homes in a natural environment of prime lakes and preserves. With its convenient Naples location, living here brings together the best of both city and suburban worlds. No matter which size home you choose or where you live in the Reflection Lakes community, there are ample views of natural Florida at its best. Spacious floor plans are available which overlook the community lake. Residents can enjoy taking their breakfast al fresco from a private lanai in many of the stunning homes or enjoy the tropical landscaping in their private backyard. Living here offers plenty of outdoor fun in terms of kayaking, bird watching, or just enjoy a Florida sunset at your own home. These one of a kind, choice homes on have solid concrete block construction, interior tiling with wood and carpet, and lovely shared amenities. There is a community spa, pool, exercise room, library and even a decorated clubhouse. Why not share the view by coming and seeing one of our premiere homes? 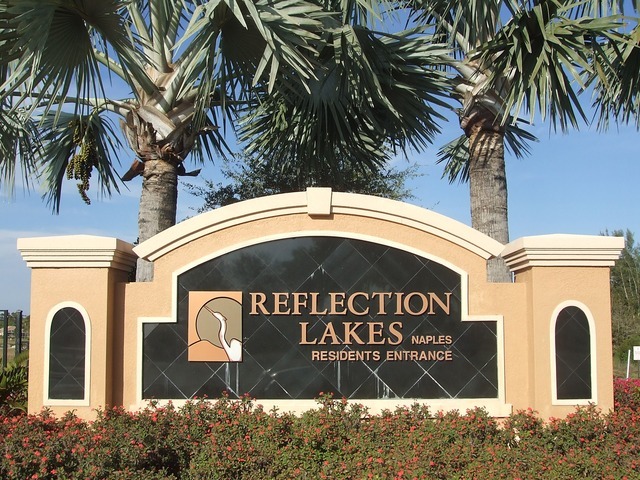 Monthly maintenance fees for Reflection Lakes condos is $457. The maintenance fee includes master insurance, cable TV, lawn maintenance, landscaping , manager , pest control , reserve , security , trash removal and water & sewer. The minimum rental period in Reflection Lakes is 30 days. A perennial favorite, Reflection Lakes condos are very easy to rent all season long. ???? Click here to see all Reflection Lakes floor plans.